No Black Friday here! But WE ARE OPEN! We are available all weekend long to show pups. Don't wait till the last minute and read a post below about my Christmas pup thoughts. Give us a call to set something up! Ok, Just about all of the new pics have been posted! Still missing the cockapoos, but should have pics of them later today. Other than that, everything that I am going to have between now and the end of the year has been posted. We are scheduling appointments all day Friday, Saturday and Sunday this week, make sure you check the links tho, because the pups that aren't going to be ready till December 6 will not be able to be shown this weekend. This is a picture of one of our large crate packages. More info is on the waiting list, crate training link to the right. Good News - Newest litters of pups will be ready a little earlier than originally exected. All of the pups that I said would be ready somewhere around December 9, will actually be ready to be shown on Friday, December 6. I should have pics put up on the site within the next few days. I am already scheduling appointments to come view these pups. Don't wait too long to schedule; our pups move pretty fast. 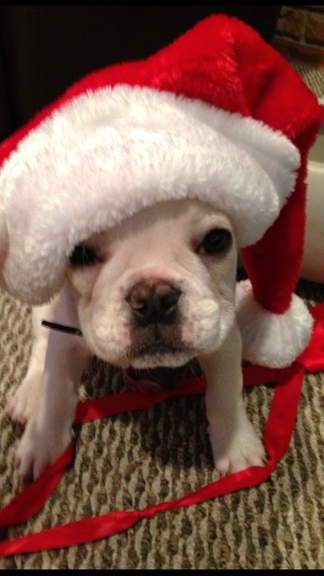 This is a picture one of our clients sent me last year of a pup they had just gotten from us. I am pretty sure they won't mind me sharing it with you. It is so darned adoreable! Ho, Ho, Ho, no more argghhhh . . .
Ok, I have my head wrapped around the holidays now and am feeling excited and somewhat organized. First of all, I try to answer all emails several times a day. The last few days got away from me and I tried to answer everything this morning. After working my way through the emails, I am a little worried, I may have skipped someone. If you are still waiting for a reply, please shoot me an email and I will reply asap. Information regarding all puppies that will be available now through the end of the year are on each links. I don't have pictures of the pups that will be ready after December 10 yet. They are still a little small to truly capture a nice shot. I am ready to schedule appointents now through the end of the year. With as many pups and more people than pups wanting to add a new family member, I recommend you get on the schedule or waiting list asap. As a courtesy, the only thing I ask; if you change your mind or something comes up and you cannot make your appointment, it is no big deal. Just please, please let me know. You can send me a text or give me a quick call. Especially at this time of year, when appointments fill quickly, I can move someone who is waiting for a time slot to that time. As always, we have our crates and crate packages available. I am working on some really cute red with big white polka dot crate bed covers that will be ready this week. In the next few days, I will also have gift baskets available for the extended canine members of your family who you want to remember at this time of year. I know that "Shopping Small Business" is getting thrown around a lot. I try to frequent as many small business owners as possible as I know what it is like. I hope that you will take this in consideration this year when shopping. Looking forward to meeting with all of you and making your home a little more joyous! Please read post below to understand how we handle the Christmas season addition. AAarrrggghhhh - Christmas is creeping up on us fast! I am not a humbug, but I have been getting calls all day on Christmas pups and in my head it is still September and I guess I haven't been thinking Christmas. Although, I have already attended my first holiday luncheon! I do know exactly what pups I will have between now and the end of the year. Once they are spoken for, that is it. I cannot call Santa and ask the elves to make more puppies. Last year, I posted my thoughts about getting a pup on Christmas. I know lots of people do it, I know lots of people will want to do it this year and though I don't think it is the very best time; in order not to be a hypocrite (I got a pup on Christmas Eve for my kids when they were little), I do get it. A client last year had a great idea. I was not familiar with the "newer" Elf on a Shelf concept. She clued me in and asked me to help her out. Her little girl got a note about 2 weeks before Christmas telling her to visit my address for a big surprise. When she got here, I was all excited and told her that she would never believe who visited me that day. I told her that I heard a bunch of racket out in the yard and sleigh bells and a big Ho, Ho, HO! and there the Big Man was standing at my doorway. He explained to me, that it was much too cold on Christmas Eve to be traveling with puppies and asked if I would help. The expression on this little girls face was priceless. I would be happy to do it again and again. IF you really need to surprise the kiddos on Christmas Eve or Christmas Day, I would suggest choosing your pup and putting a deposit down to hold the pup. You can pick up until 4 pm on Christmas Eve. I do charge an extra $25.00 holding fee, in addition to a 50% deposit. The hold fee covers us caring for your pup and if the pup is due for another vaccine, that will be administered as well. The balance is due at time of pickup. We will have a whole bunch of pups available, I am not going to update the links just yet, but here is a list of the breeds. Bichon poos, Boston Terriers, Cavapoos, Chihuahuas, Cockapoos, Maltipoos, Morkies, Poms, Poodles, Pugs, Schnauzers, Schnoodles, Shihpoos, Shih Tzus, Yorkies and Yorkipoos. If you are thinking of any of these pups, make sure you give me a call to get on the waiting list. You can read how my waiting list on the link to the right. Look forward to a happy, healthy and joyous holiday season for all and of course for the PUPS.